A Jewish friend of ours rarely refers to our Heavenly Father as "Lord," or "God," or even "G-d." Rather, our friend calls Him, "Ha Shem," which in Hebrew means, "The Name." This is a tradition practiced by many devout Jews. What do they mean by calling God, "The Name"? When you read the Old Testament of the Bible, you may notice that God is usually identified as "the LORD," in all capital letters, instead of "the Lord." The capitalization means more than simply showing respect for God. Rather, it shows respect for God's holy Name. Whenever you see the phrase "the LORD," that shows that the word in the Hebrew text is God's Name, YHWH (often pronounced "Yahweh" or "Jehovah"), the Name that means, "I AM" (Exodus 3:13-15). In the First Commandment, God says, "You must have no other gods before Me." Literally, the Hebrew text says, "You must have no other gods in My face!" What does this mean? Martin Luther's simple answer in the Small Catechism: "We should fear, love, and trust in God above all things." All the other Commandments flow out from the First Commandment; or to say it another way, all the other Commandments explain the First Commandment. So it is significant that the next Commandment is about God's holy Name. When you first learned the Ten Commandments, you were probably taught that this Commandment about honoring God's Name, means that we should avoid profanity – using God's name to curse. "My God!" is a common expression used by both Deaf and Hearing people to show surprise or concern. (Hearing people sometimes express anger by cursing, "Jesus Christ!") How sad it is that many Christians do this. My heart breaks when little children say, "O my God!" as they copy their parents, who should know better. People who hate God mock His name. Hollywood makes movies which portray a lustful Jesus. The National Endowment for the Arts funds artists who display a crucifix of Christ in a jar of urine and make a nativity scene out of dried poop. The full meaning of this Commandment and its application to our daily lives goes much deeper than just showing respect for God's name in our conversations. In coming issues of the Mustard Seed we will dig deeper into this Commandment about God's Name. Click your browser "back" button to return to you place in the artcile. 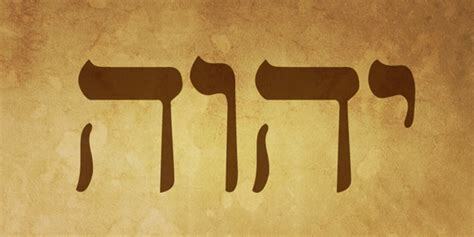 1 The Hebrew text of Psalm 110:1 has both words, YHWH and Adonai, represented in English by "LORD," and "Lord." 2 Lutherans and Catholics refer to this as the 2nd Commandment; most other Christian churches call it the 3rd Commandment. How we number the Commandments is of little importance; what is important is that we understand and obey what the Commandments say. 3 For further study on this topic please read: Exodus 20:1-7; Matthew 15:18-19; Ephesians 4:29 - 5:20; James 3:1-12.